Months after it was confirmed that they had returned positive A samples for the black market, highly toxic drug GW501516, the riders Paulo Vargas Barrantes, Pablo Mudarra Segura, Allan Jose Morales Castillo and Miguel Armando Ubeto Aponte have all been handed two year bans. BCR Pizza Hut riders Vargas Barrantes, Mudarra Segura and Morales Castillo tested positive in the Vuelta a Costa Rica in December 2012. Those failed tests were announced on April 14th by the Costa Rican federation FECOCI, along with a positive A sample for the same substance by Steven Villalobos Azofeifa. Then, on May 15th, the Lampre Merida competitor Miguel Armando Ubeto Aponte was also linked to the use of the product. The Costa Rican Federation has announced that it was notified by the UCI on June 18th to open disciplinary proceedings against Vargas Barrantes, 2012 national champion Mudarra Segura and Morales Castillo. The national anti-doping disciplinary committee weighed up the cases and decided to apply two year bans, starting on April third of this year and running until 2015. All three were disqualified from the results of the Vuelta a Costa Rica. Vargas Barrantes won stages two and eleventh and finished ninth overall; Mudarra Segura had six top ten stage placings and was eighth overall, while Morales Castillo was fourth overall, just one step off the podium, and took three top five stage placings. Meanwhile the Venezuelan Ubeto Aponte has also been handed a two year ban. He tested positive in an out of competition test carried out on him on April 16th of this year, and analysed at the WADA lab in Koln. The 36 year old rider competed for small teams for the majority of his career, but was signed by the Lampre Merida team prior to the current season due to the points he had amassed. He claimed after his positive test that he was prescribed the substance by a clinic in his home country after he fractured his arm in the Vuelta a Tachira in January of this year. Ubeto Aponte has blamed the Atias Clinic in Caracas for what he maintains was their error. He said that he realised in March that the product was on the banned list when WADA gave a strong warning about the dangers of its use. Ubeto Aponte claimed he stopped taking it then, but was snagged when given an out of competition test several weeks later. He told Radio Deporte de Venezuela that he had just received notification from the UCI that he would be sidelined for 24 months, although he states that he plans to appeal the severity of the sentence in one year. Usage of the substance GW501516 appears akin to Russian Roulette, with WADA issuing a rare warning about its use in March. It was originally developed by GlaxoSmithKline but after it was linked to the development of multiple tumours in laboratory animals, was abandoned in 2006. The company determined that in all doses, the drug quickly caused tumours in test animals in a number of organs, including the liver, bladder, stomach, skin, thyroid, tongue, testes, ovaries and womb. It has never been approved for human usage, but the substance subsequently emerged on the black market. 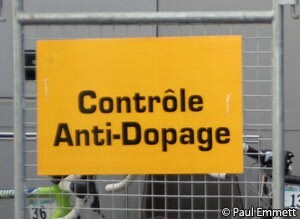 It has been banned by WADA since 2009, and is clearly detectable in anti-doping screening.